Don’t forget about this show. I am purposefully not doing many shows this week as I have been rehearsing for a special Relay for Life performance on Sunday, March 30th and prepping for tonights’ show at Blue Fusion. The show tonight is important to me, because its part of a Professional Staffing Company, Kelly Service’s, attempt at making a real life difference in people’s lives through second life by providing people with an opportunity to find employment. The use of a virtual world for Job Placement, in my mind, is fascinating and I love the creative use of the platform to do so. They are supportive of live music and I’m grateful for the opportunity to be included in their “roster”. 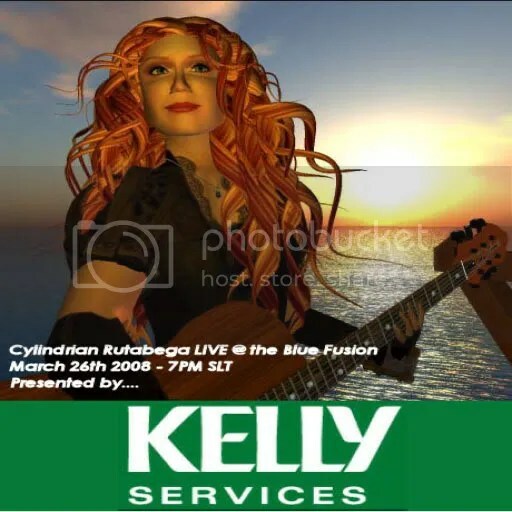 Here’s the advert from the previous blog entry with links to get to the show, Kelly Services’ Sim in SL, and their website talking about their presence in SL. Thanks to Holli Hollwood of Blue Fusion for this opportunity. by creating your FREE Second Life Account Today! *I personally am very excited to see a company come into Second Life and use the platform in a way that can positively effect people in their real lives by providing real jobs through a virtual environment. Please come to this concert and see for yourself what the company is all about.